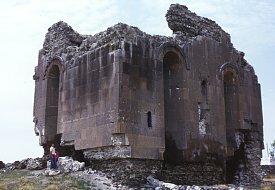 A grey hulk of masonry - the remains of a large Armenian church - dominates the village of Oğuzlu, 16km north of Ani. 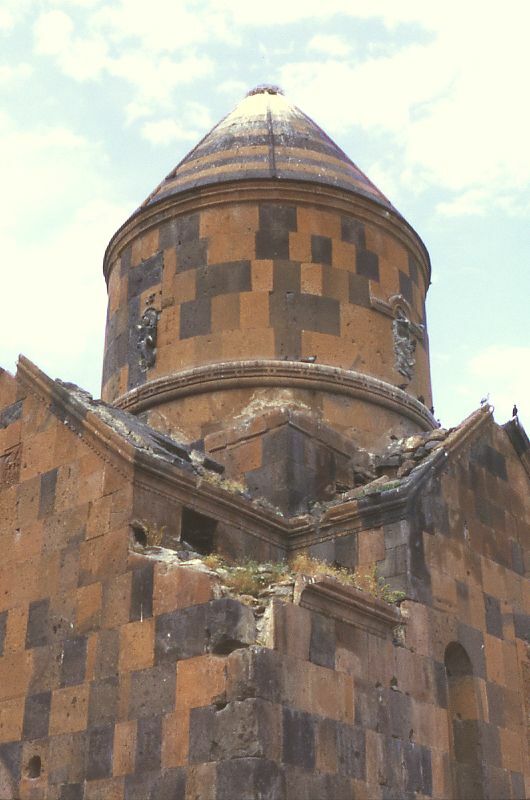 The original Armenian name of this church is not known, but an undated inscription on its wall states that it was built by a certain Hassan Gnt'uni. 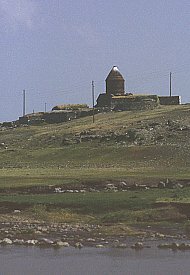 He has been identified as the military governor of Kars during the reign of King Smbat (890-914), and since Smbat is not mentioned in the inscription it is also suggested that it may have been built after Kars rebelled against and temporarily broke away from Smbat's rule in the first decade of the 10th century. 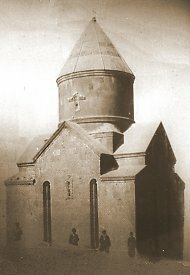 Another inscription, now destroyed, recorded that the church was renovated by "prince of princes" Ashot Pahlavid in the year 1001. At a later date the south-western corner of the church must have collapsed - it is constructed from smaller blocks of stone than the rest of the building. Perhaps at the same time (the masonry looks similar) the external walls were heightened and the entrances either walled up or reduced in size. This probably indicates the conversion of the church into a fortified place of refuge - a similar conversion happened to the nearby church of Shirakawan. 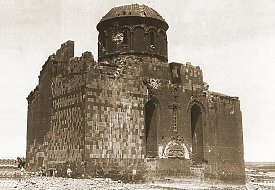 The church was still intact during first quarter of the 20th century. 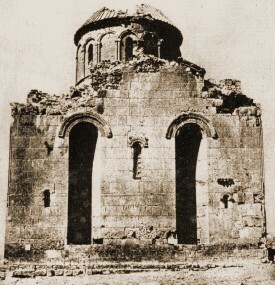 The dome and the south-west corner are said to have collapsed during an earthquake in 1936. The fallen masonry was probably plundered for building materials. The church has a triconch plan set inside a rectangular perimeter. 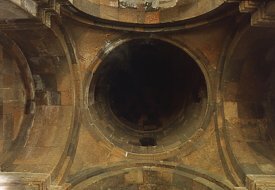 The cylindrical drum, surmounted by a dome, rested on pendentives. There are chapels on either side of the apse. 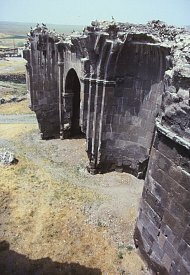 Above each chapel is a rectangular room, inaccessible except by ladder or rope and probably intended as hiding places. Unusually for three-apsed churches of this period, there are no matching chapels in the north-west and south-west corners. Instead, there are rectangular bays open to the nave. 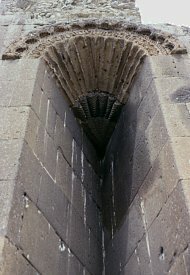 Deep niches, capped with shell-shaped mouldings, are very prominent external features in the north, south, and east facades. On the tympanum over the southern door was a relief sculpture of the Virgin seated on a throne, holding the Child on Her left knee, and being approached from each side by a figure on horseback (perhaps benefactors of the church) each accompanied by an angel. 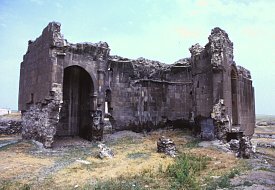 In the tiny village of Yağıkesen, 6km east of Oğuzlu and 15km north of Ani, is an old church that is known as "Kizil Kilise" in Turkish, "Karmir Vank" in Armenian. Both names mean the same, the "Red Church". 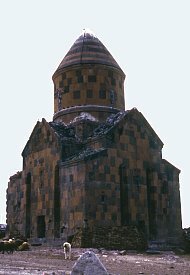 Since there is a similar church in Armenia also called Karmir Vank, the name Kizil Kilise will be used here. The church stands on a low rise of land beside a small river, in the midst of a treeless and gently rolling grassland. The silhouette of its conical roof, visible for many miles away, seems in sympathy with the distant mountain peaks on the horizon. Little is known about its history, and its original medieval name is unknown. During the 19th century it was used as the village's church and was officially called Surp Astuacacin (the Church of the Holy Mother of God). 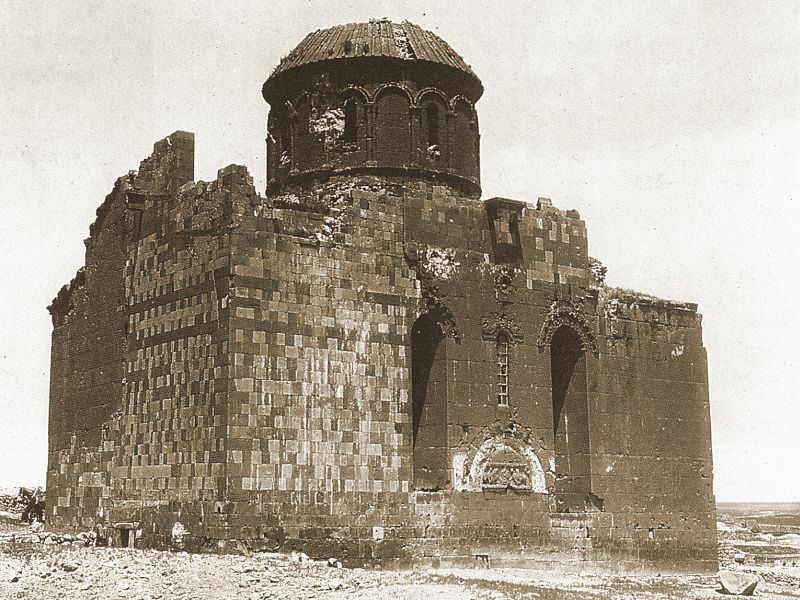 The building apparently suffered damage during the 1877 Russo-Turkish War, but was later repaired. 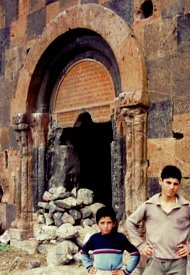 This repair is recorded in a long inscription on the tympanum over the doorway that tells of the restoration of the church by the priest Salatiel Ter Davit'eanc "by his own hands". Despite the prominence and size of the inscription, this restoration (which took place during the 1880s) probably consisted only of re-facing the saddle roof, and possibly rebuilding of the conical roof over the dome. The settlement remained an Armenian village until 1920 when its inhabitants were forced to evacuate their homes and migrate to Soviet Armenia. The church is still in fairly good condition and is currently used as a barn. 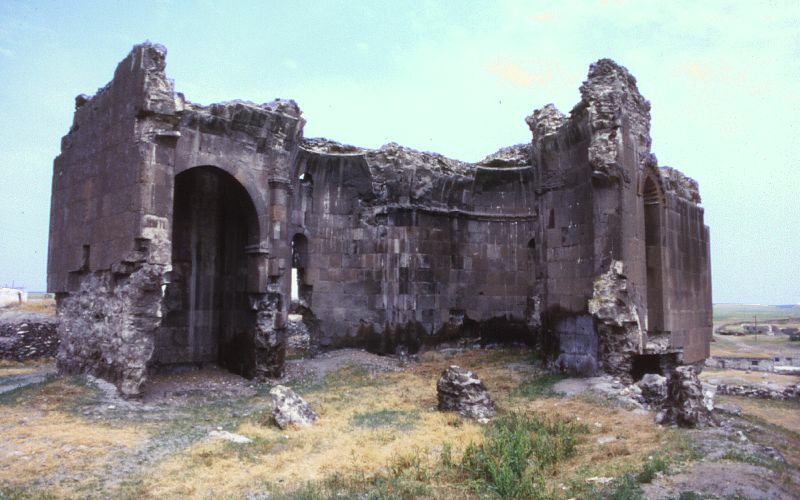 The general design of Kizil Kilise could point to a tenth century date, but decorative features on its walls suggest a rather later period than this - perhaps the early 11th century, but more likely the late 12th / early 13th century. 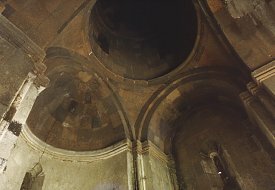 The 13th century date is backed by an inscription inside the church dated the year 1218, recording a donation made by a woman named Talit'a. 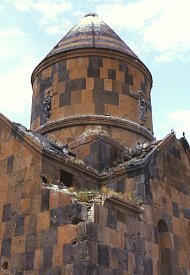 If a single building from the Ani region was to be chosen as a representative of typical medieval Armenian church architecture then Kizil Kilise would be an ideal choice. It is a compact and free-standing building, small in size but monumental in form. It is built of carefully cut stone blocks that face a concrete core. The structure rises boldly from a stepped base upwards to the multiple gables and pitched surfaces of a precisely articulated roof, with the whole design culminating in the conical roof of the dome. The plainness of the facades are relieved and articulated by vertical v-shaped niches and narrow windows. A single entrance on the western side leads to an interior that is cruciform in plan, with a dome over the central crossing supported by a cylindrical drum resting on pendentives. 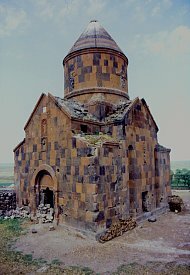 This page [churches north of Ani] was first published in 2000. It was last modified on the 1st September 2000.